Rattle and Roll Skull T-Shirt - Our Rattle and Roll Skull t-shirt comes only printed on a dark shirt and is available in most popular sizes. 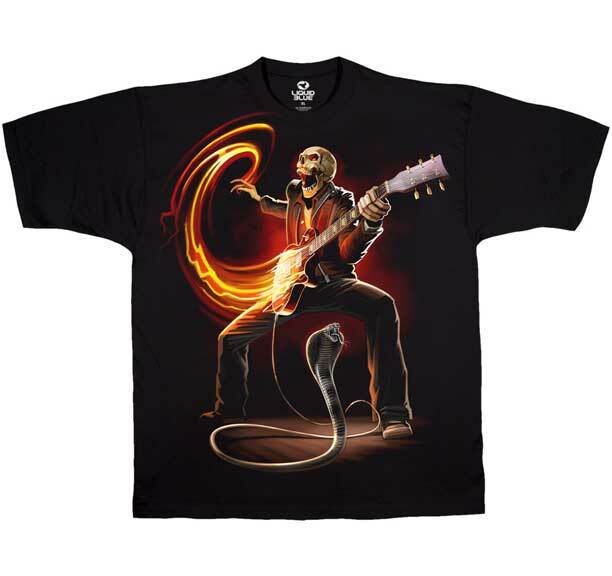 This tee shirt features a skeleton playing an electric guitar and a rattle snake rocking to the tune. This skull t-shirt makes a great gift for anyone who loves a cool looking skeleton and skull t-shirt design. Our biker skull tee shirts are first quality tees and made of a cotton poly blend mix tee shirt. All of our evil tees are incredibly comfortable and our tee shirts not only look and feel great, but are made to last. If you have questions regarding our Rattle and Roll Skull t-shirt or any of our other merchandise, please email us with the product name and number.